Product prices and availability are accurate as of 2019-04-17 21:59:53 EDT and are subject to change. Any price and availability information displayed on http://www.amazon.com/ at the time of purchase will apply to the purchase of this product. You have invested in purchasing a Keurig 2.0, inarguably the most revolutionary coffee maker to hit the shelves in the past decade. However, you were surprised by just how fast the costs of using your Keurig add up. Having to constantly repurchase cups quickly adds up to THOUSANDS of dollars per year - just to enjoy your morning cup of joe! 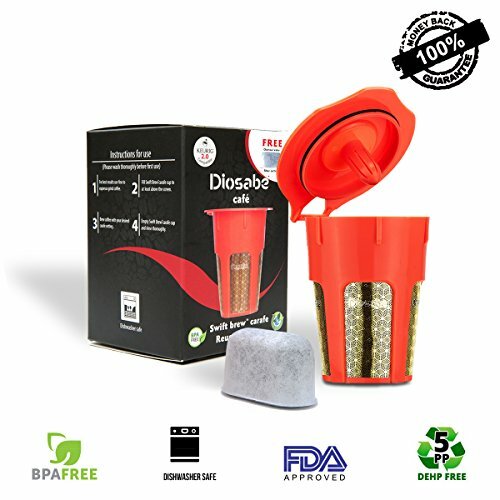 We have come up with the best, reusable K-Carafe you could ever have, to help you make the most out of your Keurig brewer! Choose Gold, Invest In Safety. Absorbing no odors, flavors or ambient scents, while inherently resistant to corrosion, gold makes a foolproof choice for use in coffee filters. Contrary to paper filters, it does not feature any chemicals or bleaching agents, which could potentially spoil the quality of your brews or jeopardize your health! Featuring a high-tech, precision diamond shaped pattern filter mesh, our K-Carafe keeps your brews FREE of coffee grounds, ensuring even, delicious sips! Eco-Friendly and COMPLETELY FREE of BPA, LEAD and DHPH, this K-Carafe was made with your safety and convenience in mind. Dishwasher Safe, you can add your carafe to your washer's top rack for swift cleaning! OF COURSE! Our K-Carafe is compatible with ALL Keurig 2.0 K-Carafe Brewers, including the popular K200, K300, K400 and K500 Series models, too! 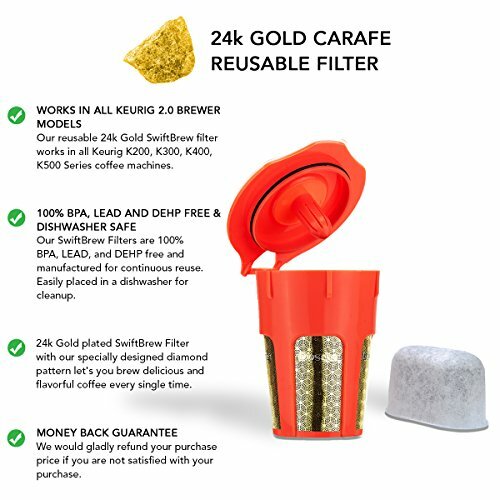 Purchase Your Very Own 24K Gold K-Carafe & Start Enjoying Your Keurig Brews The Way You Deserve! 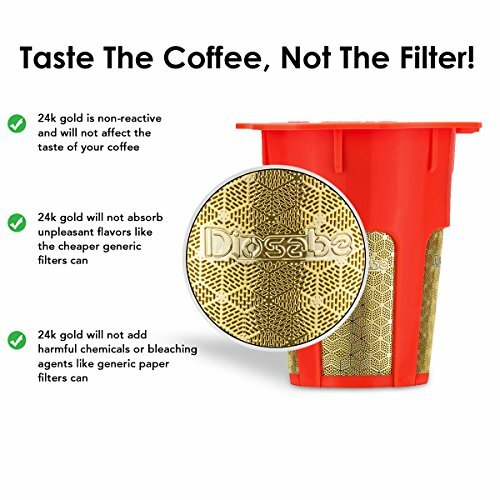 • 24K GOLD REUSABLE KEURIG FILTER: Durable, exceptionally hygienic, will not spoil the quality of your coffee, while it also retains ZERO odors or unpleasant flavors. • EVEN FLOW: Features an expertly designed diamond pattern mesh, which allows perfect water flow, resulting in consistent, tasteful brews, free of bitter, floating coffee particles. • VAST KEURIG 2.0 COMPATIBILITY: Made for use in all Keurig 2.0 models, including K200, K300, K400, and K500 Series Brewers! 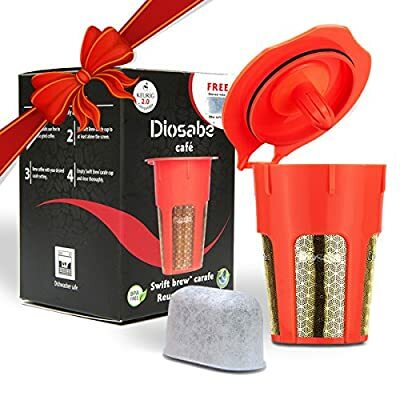 • MONEY SAVING CARAFE PLUS BONUS WATER FILTER: Eco-friendly and reusable, it will save your up to a whopping 80%, by replacing wasteful, plastic pods. 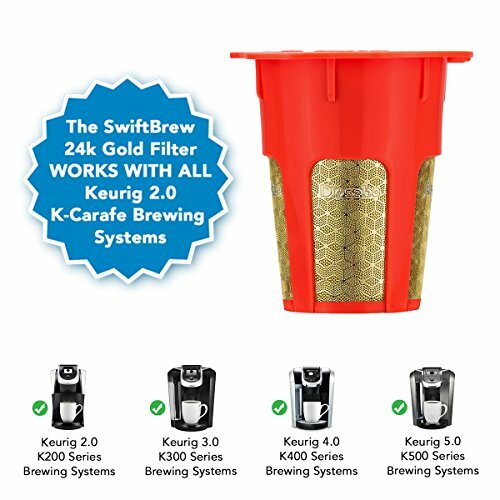 FREE Keurig Water Filter with purchase, to help you enjoy your brewer in FULL! Plus you are backed by our 100% money back guarantee! If you are not satisfied you will recieve your money back! • BPA-, LEAD-, DHPH-FREE, DISHWASHER SAFE: FREE of all common, harmful chemicals found in its low-quality counterparts, our K-Carafe is your best choice for your family's health. Purchase Now The Best 24K Gold K-Carafe On Amazon!